These peanut butter cups are a snap to make! My hope is that people who are new to lower sugar and sugar-free desserts will find these chocolaty confections to be an easy transitional treat. The ingredients are easily accessible and affordable, too. 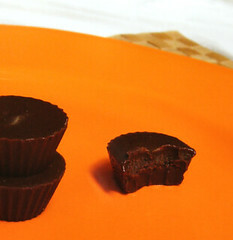 Two versions of the peanut butter cups are posted. The first one is the quick and easy primal version, and the second one is the low carbohydrate version. The low carb version came about through my experiments with making chocolates using erythritol and xylitol. I didn’t think the peanut butter cups would ever taste right using those sugar alcohols, but the bit of added honey and the xanthan gum worked magic! The honey and xanthan gum eliminate the “gritty” texture of the erythritol and xylitol. A note for my primal readers: I used peanut butter in the candies you see above since I do eat legumes (peanut butter, chickpeas in hummus, and black beans for this delicious chocolate cake). You can substitute almond butter, sunflower seed butter, or even macadamia nut butter for the peanut butter. Just be sure to get a nut butter with a very smooth consistency. I’ll admit to using commercial peanut butter when I make these, just because it makes the texture incredibly luscious! You can probably tell that I don’t sweat the small stuff when it comes to living a low carb whole foods lifestyle. It’s great to strive for perfection, but I know my limits when it comes to this stuff! If you’re too strict, it can be difficult to stick to healthy eating long term. This recipe is inspired by the Carob Fudge posted by the clever and creative Ricki over at Diet, Dessert, and Dogs. Check out her lovely gluten-free and vegan recipes. 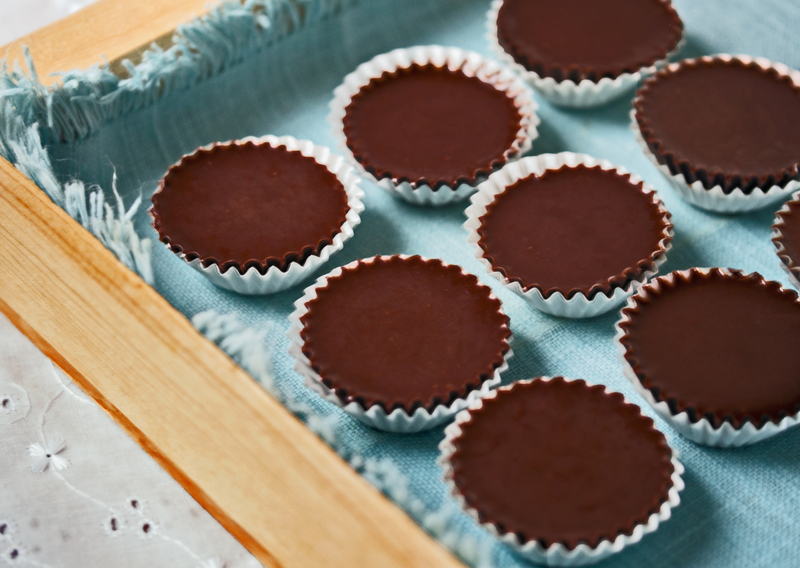 Skip the packaged candy and make your peanut butter cups at home! 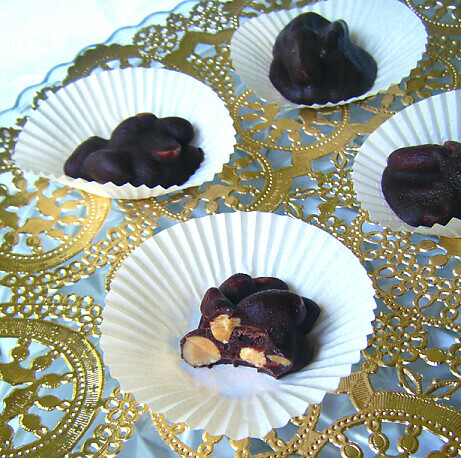 These treats are the most delicious vehicle for coconut oil and anti-oxidant rich cocoa powder. You can make them in minutes! 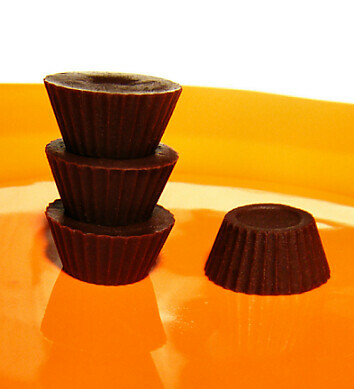 Make these candies using paper candy cups in a mini muffin tin to avoid messy fingers. Grind Truvia or erythritol and sea salt into a fine powder in a Magic Bullet blender or clean coffee grinder. Dump powdered mixture into a small saucepan over low heat, and add honey, nut butter, coconut oil, and cocoa powder. Stir mixture around for a couple of minutes with a spatula until liquified and smooth. Stir in vanilla. Pour the final mixture into silicone candy molds or mini muffin paper liners. Freeze candies until hard. Pop candies out of silicone molds, and store in zip top baggies or tupperware, separated by wax paper. Remove candies from freezer just before serving. *Refined coconut oil does not taste like coconut, so it works well in this recipe. **You can substitute smoothly ground almond butter or sunflower seed butter for the peanut butter. The chocolate peanut butter mixture also works as a delicious candy coating! 28 Comments on Healthy Peanut Butter Cups – Homemade Treats that are Low Carb, Primal, and Nearly Sugar-Free! Thanks for the idea! I know my dad will love these for Father's Day. I have a bit of cocoa butter that I might use in place of the coconut oil to see how it turns out. It might even be able to sit out of the fridge longer. Love it! I cant wait to try these out! Thanks so much! omg I want to try these! I'm getting back on the low-carb wagon and neeeed chocolate! Thanks for posting. These look delicious! I've been eating Primal and low-carb for about three months now and I'm always looking out for good recipes. Thanks! Yummy! Great idea. Nothing better than PB Cups! Whole Foods makes a healthier PB that is just like commercial PB, you could try that if you felt like it.. you'd be surprised at it's yumminess. I tried this last night, and both my husband and I really like it! Didn't have muffin cups, so I froze it in the bottom of a banana bread tin so it shaped like a candy bar. Thanks so much for the recipe! I loved how easy it was. Yum, homemade PB cups are so much tastier and better for us than storebought. I've actually found that powdered xylitol or erythritol work well without any grittiness. Delicious!! I even omitted the honey and just used erythritol with a little extra stevia concentrate and they still turned out great! Thanks! 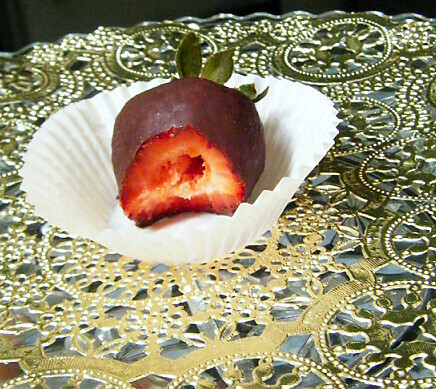 just made these…very yummy! I was a little nervous when I tasted it before freezing, because there was a stevia aftertaste, but somehow it disappeared while they were in the freezer. 2 of my 3 kids approved, too; the five year old declared them "too dark chocolatey." Just made it–love it! Thanks! Are these not chocolate coated PB bite? The way I read the recipe it is just a chocolate and PB mixture poured in the cup? Which is fine I was just confused. These are so yummy! I have all of my ingredients out on my counter to make them for the third time and thought I would go ahead and share my utter, blissful appreciation. I finally have something that I can grab for a guilt-free sweet indulgence right out of my freezer anytime. Even if I go crazy and eat 3, it's better than storebought options! I use a fusion of the recipes, I noticed that my Walmart has a sugar free honey by Honey Tree a few weeks ago, and it is pretty good! Mostly sorbitol and malitol. Wow! These peanut butter cups are delicious! You earn genius status in my book! I will be sharing this treat at a healthy food night that I will be teaching on Thursday. Thanks for sharing! These look incredible!! My fam and I are cutting out processed foods and need good all natural recipe like this! But we are only using honey and maple syrup as sweeteners. Any thoughts on leaving out the stevia extract and maybe adding more honey?? 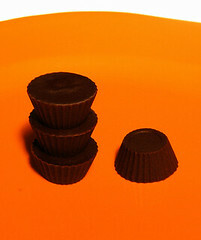 Asmallsnippet – The PB cups may not turn out firm enough if you add more liquid sweetener like honey. Let me know how they turn out for you! Hi there to every , as I am genuinely keen of reading this blog’s post to be updated on a regular basis. It includes good data. I made these tonight, and they seem to be so much better tasting than other chocolate, low-sugar or no-sugar treats I’ve made in the past. One thing to point out: your ingredients list mentions salt, but in the recipe directions, you don’t specify when to add the salt. When I read through the recipe, I knew I should add salt; it seems to make alternative sweeteners taste much better. But while in the middle of making the recipe, since I didn’t see directions on when to add the salt, I didn’t realize until I put the candies in the freezer that no salt was added. Oops! When do you recommend adding in the salt? I wonder if you might be able to update the recipe? Thanks! FINALLY! A blog that gives a low carb option AND the carb counts! THANK YOU! Really excellent but could not get it to melt. I had no honey so I looked up a honey substitute on the Web and substituted Molasses. That must be why it stayed very stiff. Still it was awesome. Next time I will use honey.